Walks on the balcony under the spire of the Moscow State University, a cocktail party at a height of 140 meters, a ladder on which Mikhail Lermontov was raised, and the highest restaurant in Europe ... 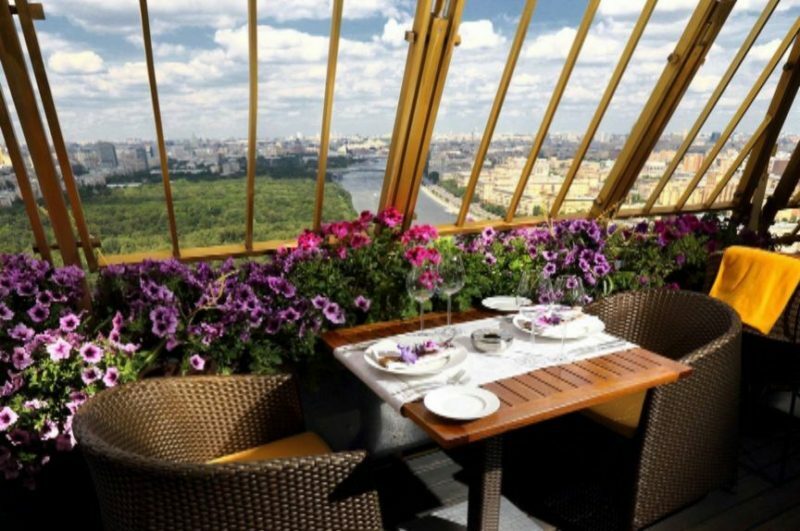 There are many places in Moscow where you can catch spectacular panoramic views. 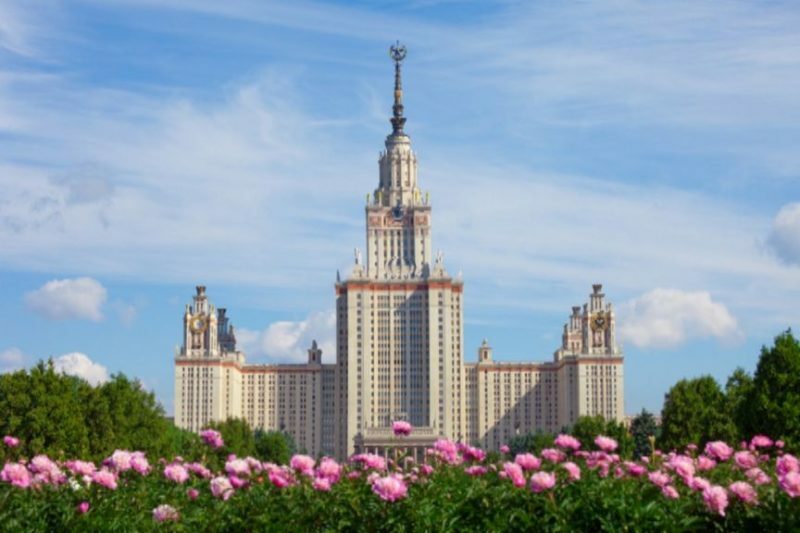 To get under the spire of Moscow State University, it is not necessary to be a teacher or university student at all. Or a creepy roller climbing a Stalinist star. Not many people know about the famous Museum of Lands, its main attraction is that it is at 200-meters high, opens its doors to anyone who orders an excursion. Collections of minerals, insects and stuffed animals are, of course, beautiful. But there is something better - an opportunity to go out on a circular balcony on the 32nd floor of the Moscow State University within the framework of the excursion. You can order a walk either in the museum itself or from outside organizers. There are 8 restaurants in the ex-hotel "Ukraine" (now Radisson Royal). However, only one of them - the Italian Buono, the project of the restaurant holding Ginza Project - boasts a good overview. 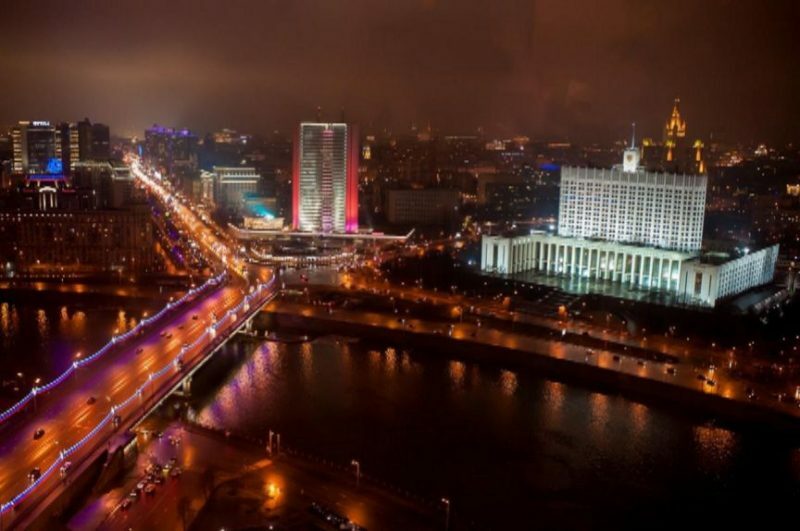 The establishment is located on the 29th and 30th floors of the renovated Stalinist high-rise. From the huge windows (the "trump" tables located along them, along the perimeter) a circular panorama of Moscow is opening. In the menu - pasta, pizza, risotto and indispensable for a restaurant designed for an audience above the middle class, an "exotic" like langhustins, octopuses and sybas. (340 meters). The view from the platforms opens completely fantastic, but it is better to choose a clear day for a visit. Sixty proudly calls itself "Europe's highest restaurant", and it is not an exaggeration (rarity for an advertising syllable). At least until the restaurants in London’s style "Shard" have opened. The establishment is located on the 62th floor of the "West" high-rise in the Federation Tower. The views from there to Moscow-City and Moscow itself are breathable, and even if you take a table in the center of the hall, you can still walk freely along the windows. Some people arrange promenade with binoculars. Regularly the employees of the restaurant open one of the windows especially for visitors. The glass panel moves to the side, and you can push your head "to the street". From here, from the height of 80 meters, one of the best views opens to Moscow: the Temple of Christ the Holy Assumption, the Shukhov and Ostankino TV towers, the huge dome of the sports complex "Luzhniki", the blue skyscrapers of Moscow - City, the House on Mosfilmovskaya, the embankments and the Stalinist highlands - all this, even without a binocular, can be seen well in a clear day. A viewing platform on the Sparrow Hills appeared along with the new building of the Moscow State University in 1953. Today bikers are meeting here regularly – to boast of cool motorcycles, wedding limousines are parking here and photomodels are posing. And recently, this place was famous for grandiose laser shows. From this bell tower the expression "all over Ivanovskaia" was appeared - the royal decrees were pronounced here which were heard even on the Ivanovo square. 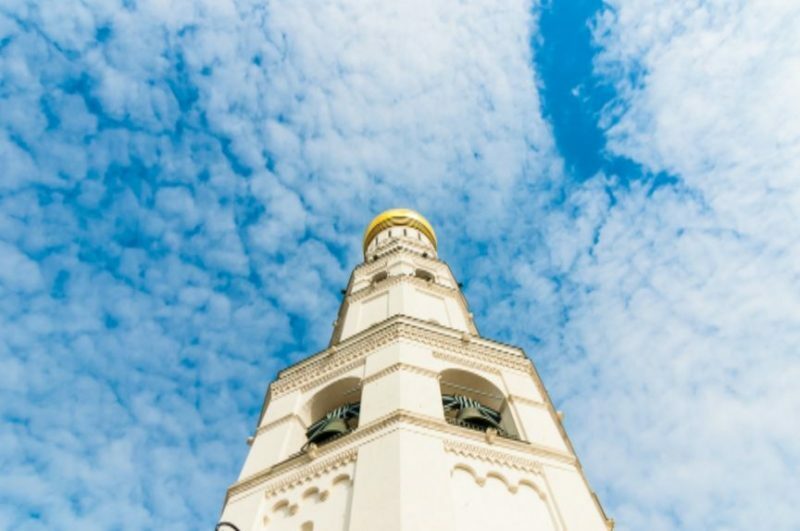 During two centuries the belltower was the tallest building in Moscow. Today here a museum of history of architecture is located. Together with the excursion, you can climb a 25-meter high (137 steps). Just like the Junker of the Leib-Guard of the Husar Regiment Mikhail Lermontov, who wrote in the XIX century: "Who has never been on the top of Ivan the Great ... has no idea about Moscow". From October to April, the entrance to the belltower is closed. 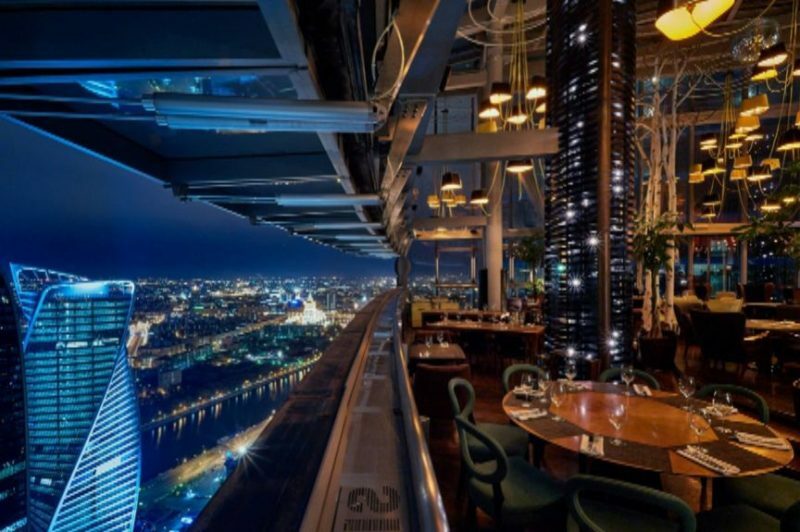 The bar with a crazy panorama is located on the 34th floor of the Swissotel Krasnye Holmy Moscow Hotel. 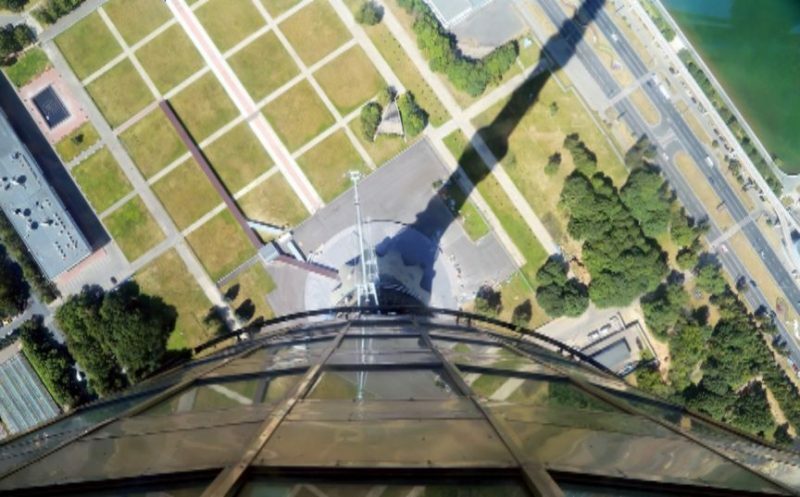 At a height of 140 meters, no view is blocked by something: neither the ugly construction in the neighborhood, nor the part of the building in which, you, actually, are. 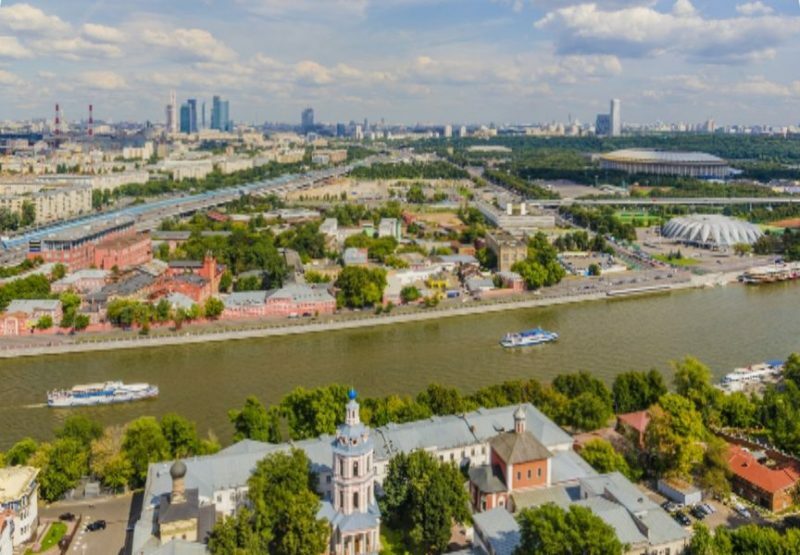 Here, as in the palm there are the Stalinist towers, the traffic jam on the Garden, the Kremlin and the Church of Christ the Savior, and unfortunately you have to pay for it. There are a lot of strange cocktails in the menu, from the Trans-Siberian Express (with sea buckthorn jam) to the "Gourmet Cinderella" (obviously, with celery tincture). 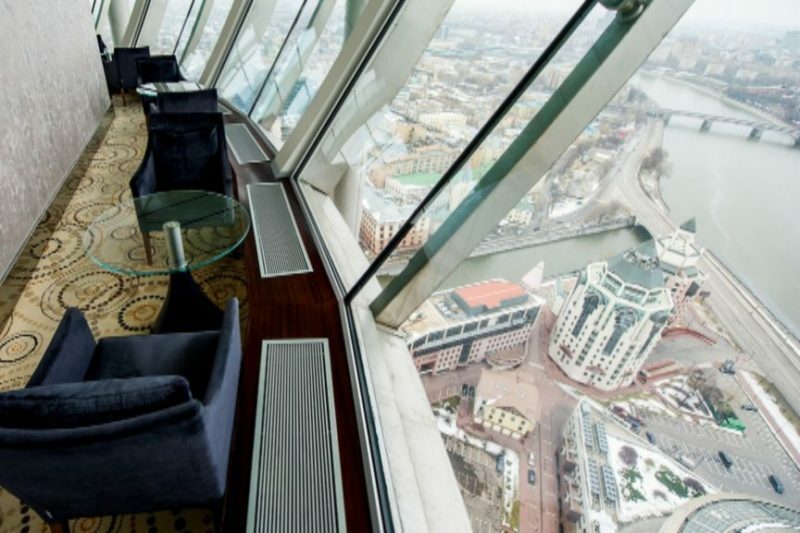 Sky Lounge is one of the old capital panoramic restaurants in Moscow. It is located on the 22nd floor of the Russian Academy of Sciences, straight under metallis constructions of golden color, due to which the building was named as "brain". The views from the windows are picturesque and eco-friendly: directly - the core of the "Not boring garden", on the left - desert embankments of Moscow-river. You do not meet the scientists at a restaurant – the prices do not allow. Salads here cost at least 800 rubles, fowl costs from one and a half thousand. But the alcoholic card in comparison with high-ranking competitors - Sixty in Moscow-City or Buono in Radisson - here costs democratically. 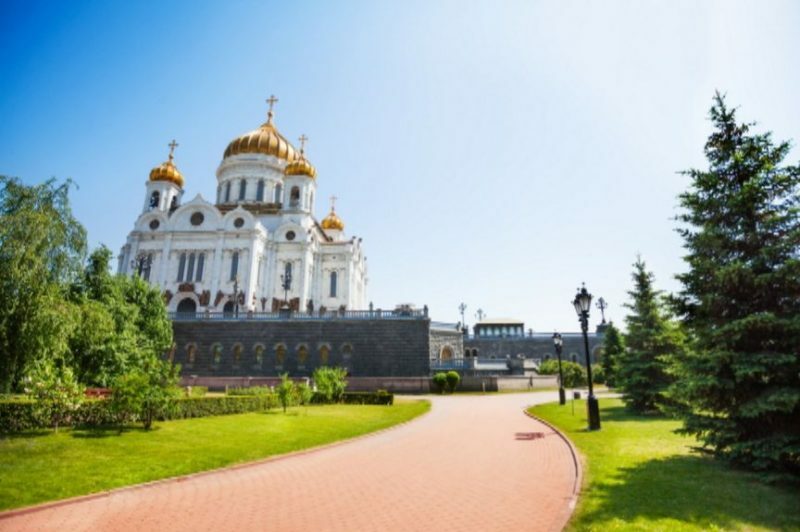 Few people know that the largest cathedral of the Russian Orthodox Church (height - more than one hundred meters, the total area - almost 4000 square meters) also has observation platforms. There are four of them, and they are located between the bells of the temple, at 40-meter high. From there, of course, the Kremlin, the streets and mansions of old Moscow, the New Arbat, Poklonnaya Gora are visible well enough.